Begin by selecting your course package. Our most popular option is Unlimited CLE. 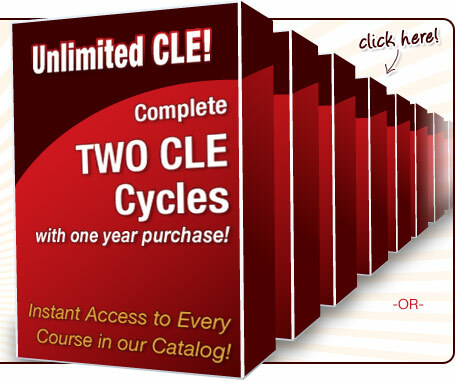 An Unlimited CLE subscription enables you to fulfill multiple CLE cycles with one purchase. We have assembled our most popular courses into our “One-Stop Bundles” in order to save you time and money. Alternatively, you may choose to “Build-A-Bundle” to select the courses that interest you most while taking advantage of our bundle discount. If you’re just looking for a specific course, simply add it to your cart to begin! Courses are available immediately upon checkout. You will have 24/7 access to your purchased courses during the lifetime of your subscription. Courses can be started, stopped, and paused at any time. You can immediately print your CLE certificate upon completion of a course. A copy of your certificate will remain in your account and will always be accessible to you. The United Institute for Continuing Legal Education is committed to providing attorneys with the fastest, most efficient and economical CLE solution. With a continuously expanding library of courses and a simple, streamlined course selection process, UnitedCLE.com makes completing your CLE requirements simple and enjoyable. The United Institute for Continuing Legal Education is an accredited CLE Provider in California, CA Provider #15390. In addition, we offer fully accredited CLE courses in the states of Alaska, Alabama, Arizona, Colorado, Connecticut, Washington DC, Delaware, Florida, Georgia, Hawaii, Iowa, Idaho, Illinois, Indiana, Kentucky, Louisiana, Massachusetts, Maryland, Michigan, Missouri, Mississippi, North Dakota, Nebraska, New Hampshire, New Jersey, New Mexico, Nevada, New York, Ohio, Oklahoma, Oregon, Pennsylvania, Rhode Island, South Dakota, Tennessee, Texas, Utah, Virginia, Virgin Islands, Washington, West Virginia, and Wyoming. To view more about the specific accreditation in your jurisdiction, choose your state in the box on the left.